Agile Moves are a framework for modifying work habits and achieving set goals. which results in an overall improvement of the team’s interaction and productivity. Agile, because the steps should empower the team to think and work in an agile manner. 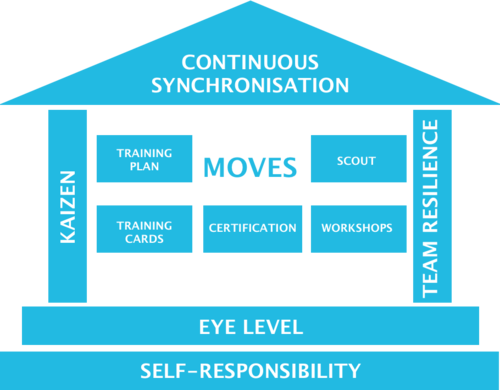 Moves, because individual elements from a variety of methodologies (such as Scrum) have been adapted to form a series of steps, similar to dance moves. Analogous to learning how to dance, individual moves are specifically trained, in time forming a large, sophisticated repertoire which leads to the incorporation of agile values in the daily work routine. I want to do it - how do I start? Remote Moves are training sessions and plans which are specially designed for multi-site teams. With Remote Moves, these teams can improve synchronization and enhance their collaboration abilities to even surpass the performance of single-site teams. This page was last modified on 6 April 2016, at 17:04.